When building a home or business, security should always be your number one concern during and after creation. Having adequate security is needed to give you the peace of mind you deserve. It is even more important to have excellent security measure if you have a business with a large amount of secured personal traffic coming in and out throughout the day or if the contents of your business is hazardous or not suitable for the public. Most corporate headquarters chose to have security booths to control who comes in and out because of sensitive information that could be heard. Having guard booths outside of your home or business is a positive thing to add to your commercial or residential property. The sheer presence of guard houses gives the natural appearance that your property is heavily secured and people will take more caution when deciding to come onto your property. If you have made the decision to purchase prefabricated guard houses for your commercial or residential property, you have certainly come to the right place. We offer the best guard booth available online for many different reasons. We at Panel Built promise to make the task of installing your new security measures easily and more simple than you could have ever imagined, so let’s get started. 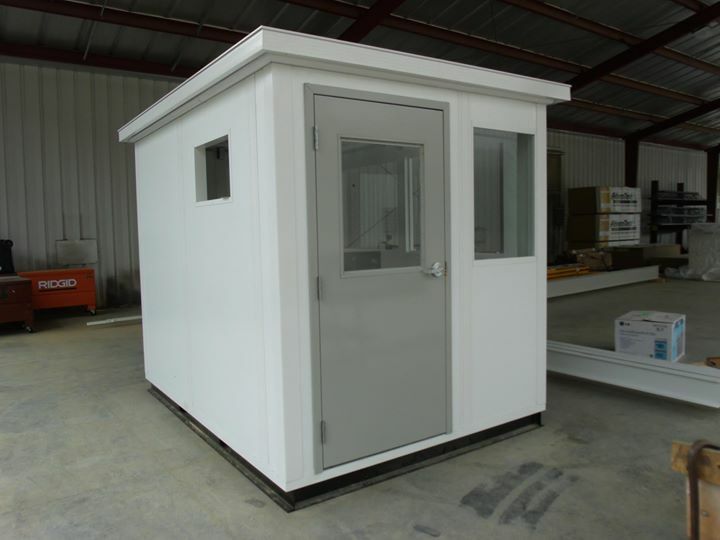 You may have seen many guard booths available online for sale offering the option of it being prefabricated. The benefits of buying prefabricated security guard houses are endless. Having a modular guard house be prefabricated means that your life becomes a lot simpler. There is no long installation process and no real construction will need to take place on your premise to install them. This is extremely beneficial for residences and commercial properties that see a high volume of traffic. Having serious construction occur while people are trying to travel in and out of the premise can be a huge hinderance all around. All of our guard booths available online for sale are pre-constructed for you with the option to customize them the way you would like them to look. The actual base of our guard houses are already completed, which lessens the time it takes between ordering and actually arriving on your property. However, many companies that sell security booths online do not offer the option of customization for their booths. We at Panel Built believe it is important to have the option to customize at least some of your security booths because it gives you the freedom to choose the look at feel of the house, but still have the ease of installation, construction and shipping times. Built-in shelving and pre fitted electrical units with no need for ducting is some of the many customizations we offer that will make your life easier. Need AC and heating? No problem. Make it more comfortable for your security guards with some of our many possible additions. We offer several types of custom roofing options to fit your wants and style. We are happy to offer shed, gable and standing seam roofs as part of our customization plan. We also offer you the option of having the entire customization process take place in the factory, or we can assemble it on-site if that is what you wish to happen. The freedom to chose is in your hands. We are a panel built security booth company online that want to give you the best of both worlds. Another aspect that you should take into account when searching for where to buy prefabricated guard houses is whether or not they are portable guard houses. A portable guard house means many different things for the purchaser. First of all, each guard house will be delivered to you pre-packaged for easy shipping. You simply have to unwrap and place into place with a forklift to install. There is no heavy construction around the house. Secondly, the guard house has the ability to be moved from place to place quite easily. So, the position that you first place the guard house in is not the place it must stay during its duration on your premise. This is beneficial to many people because if, by chance, they decide to move locations, they do not have to leave their security house behind. They can simply remove the security house using a forklift and take it with them; no need to purchase new ones. The other amazing things about having a guard house that is modular is that it is extremely simply to add or change things about your security booth. Want a new roof? It’s no problem. No heavy construction is needed. Want new panels that match your company’s style more exact? Not an issue. The great thing about the guard houses being panel-built is that the panels are simply removed and installed with minimal effort. We at Panel Built want to work with you to bring you the best guard booth available online. If there is anything that you would like to add to your security booths before you receive them, simply contact us and let us know so we can create whatever it is you would like. Experience the difference between the ease of using a prefabricated building and having to spend the money and time to create something from the ground up. Your business and pocketbook will thank you.